Before Weight: 365 pounds. I was probably heavier than that, but I stopped weighing myself. How I Gained It: I've been overweight most of my life. I gradually put on more after I graduated from law school, until maxing out in February of 2011. I was not engaged in any form of physical activity and I ate anything I felt like eating, at pretty much any time. I drank a lot of soda and ate fast food frequently. I loved pizza, wings, cheeseburgers and beer. 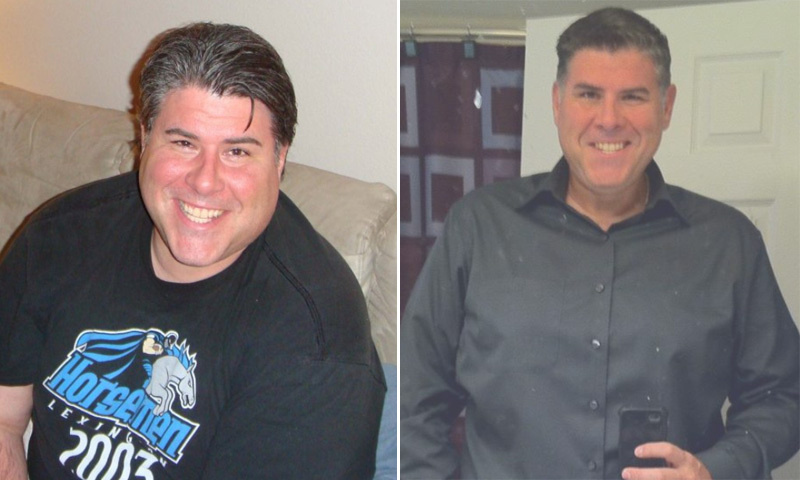 Breaking Point: I had high blood pressure, sleep apnea and was borderline diabetic; I woke up the day after the Super Bowl in February 2011 and realized that I needed to change my life. How I Lost It: The first thing that I did was to cut out sugary soft drinks. I switched to diet soda, but limited myself to one a day. I also determined that once the 24-pack ran out, I was going to be done with soda. I also decided to cut out all processed sugars and carbs to allow my body the time to process out the bad stuff that I had been putting in for so long. Instead of processed foods, I started eating whole fruits and vegetables. And it worked! I started losing weight. After a week I made some more changes. I cut out salad dressings and switched to raw almonds instead of roasted and salted. I had tried in the past to lose weight, but I always tried to change everything at the same time. After two to three weeks I'd go back to my old ways. I found I was having more success sticking with small changes, and I continued to lose weight. In March I decided that I wanted to start exercising. So I started walking -- just a mile at first. I was very slow and it was difficult for me, but I stuck to it. I walked at work on my lunch break. Over a few weeks I noticed that I felt much better than I had felt in a long time. In April I decided I wanted to be a runner. I started using the Couch to 5K app from Bluefin Software on my iPhone. I remember the first day like it was yesterday. I had to run nine intervals of 60 seconds with 90 seconds of walking in between. I thought that I was going to die. But I stuck with it and ran my first 5K on July 4. Then I used Bridge to 10K and trained for my first 10K, which I completed on July 30. I also started biking; I love to ride. I joined the local cycling club so I could have others to ride with. I was intimidated at first, but the people in the club were so encouraging. After my 10K, I decided that I wanted to run a half-marathon, so I began training using another app from the same company. On October 23, I ran my first half-marathon in 2:42. I was thrilled. I have now moved on to marathon training. I am days away from my first marathon; the big day is February 18, when I will push myself above and beyond everything that I've ever imagined possible. I plan to complete a half-Ironman in July and my first full one in August. I can hardly wait. My ultimate goal has always been to get healthy so I can live a long life and set a positive example for my kids. But I also hope to inspire other people who feel like they are stuck being overweight. I want them to know that they aren't. I was probably the world's biggest couch potato. But if I can change my life, I know that anyone can. Sometimes it just takes a little spark of inspiration from someone to light that fire. After Weight: 265 pounds. I still want to lose about 60 more, and I know that I'll make it.